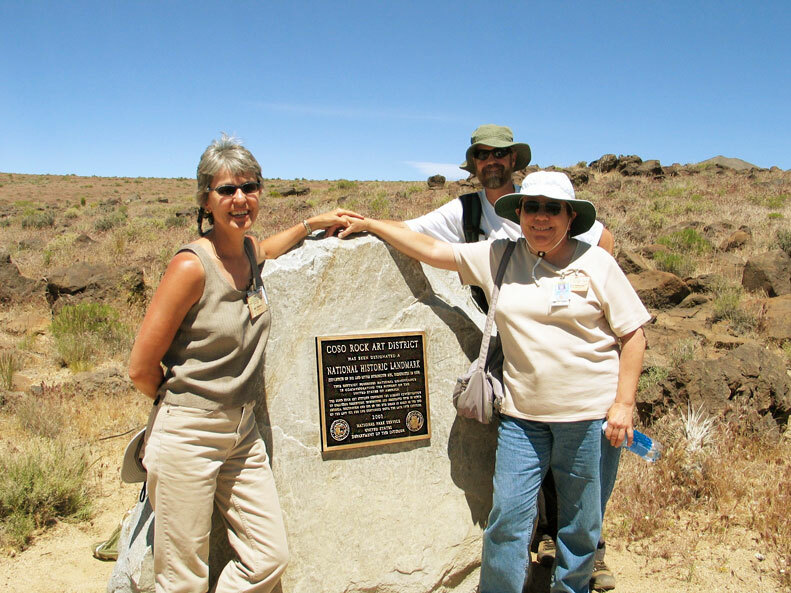 Far Western is pleased to announce that the Society for California Archaeology recently honored Amy Gilreath, Principal, with the Mark R. Harrington Award for Conservation Archaeology. National Register District, NAWS China Lake. In presenting the award at the SCA’s 50th Anniversary Awards Banquet in Ontario, California, William R. Hildebrandt cited her work resulting in the Coso Rock Art National Historic Landmark/National Register of Historic Places (National Register) District listing (May 2001), and the Gypsum Cave National Register listing (July 2010); and for preparing nominations for the Sugarloaf Archaeological District at NAWS China Lake, and for the Black Canyon Rock Art District at the Pahranagat Wildlife Refuge, US Fish and Wildlife Service (Heizer and Hester’s type site for Pahranagat style rock art). 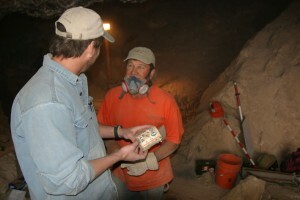 D. Craig Young (left) and Allen McCabe (right) with a 1930s milk can recovered from Harrington’s backfill in Gypsum Cave. In accepting the award, Ms. Gilreath kept to this year’s meeting theme, accepting the eponymous award with reflections on the historical accomplishments of Mark R. Harrington. 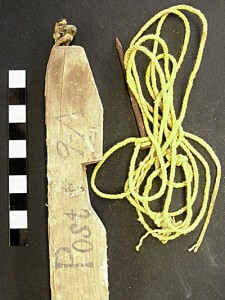 An original 1929–1930 grid stake recovered from Harrington’s backfill in Gypsum Cave. As she noted, Harrington was a precocious child who grew up in Ann Arbor, Michigan. In 1904, at the age of 20, he started undergraduate studies at the University of Michigan, becoming a founding member of the American Anthropological Association that same year. Two years later he transferred to Columbia University, where he received his M.A. degree under Franz Boas in 1908. He then ran a private enterprise as an ethnographic collector, which led to a long-term friendly working relationship with George Heye, who patronized his business. Heye, of course, is the patriarch behind the Heye Foundation, and his collection anchors what we now know as the Smithsonian Institution’s National Museum of the American Indian. In 1924, Heye sent Harrington on a collecting/scouting trip to Nevada. This brought Harrington to Lovelock Cave and to collaborate with Llewellyn Loud. This is also when Harrington and the Willis Evans family’s abiding friendship began. Pit River Indians, the Evans were the backbone of Harrington’s work force at many sites in southern Nevada, with Willis as the excavation foreman at Gypsum Cave, Lost City, and other sites in southern Nevada that Harrington studied. He also supervised other Civilian Conservation Corps field projects, and is credited with discovering Rampart Cave, a sloth-dung-filled cave in Grand Canyon. In 1928, Harrington moved to Los Angeles/Pasadena, and took a new job as Director of Research at the Southwest Museum, becoming its Curator in 1929. In the late 1920s/early 1930s he excavated Gypsum Cave, by Las Vegas, Nevada. In the late 1930s/early 1940s he excavated Borax Lake near Clear Lake, California. In the late 1940s/early 1950s he excavated the Stahl site at Little Lake, California. His close relationship with the Southwest Museum persisted to 1964, when he retired as Curator Emeritus.